Love cheese? You’re in luck. North Carolina residents don’t need to travel to France or Italy to indulge in fine handmade cheeses, thanks to the many cheesemakers situated along the North Carolina Cheese Trail. 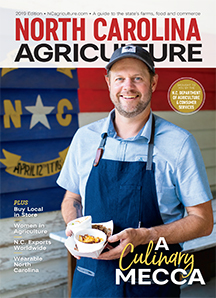 Nearly a dozen dairies and creameries across the state have perfected the art of cheesemaking, and they encourage visitors to spend an afternoon, weekend or an entire vacation exploring the North Carolina Cheese Trail. Not only do travelers get to sample and purchase award-winning cheeses, the trail also provides an opportunity to get out and enjoy the state’s scenic farmlands. Boxcarr Handmade Cheese in Cedar Grove makes nine different varieties of cheese, some of which are seasonal. Run by Austin Genke, his wife Dani and his sister Samantha Genke, Boxcarr Handmade Cheese started with 30 acres of heirloom vegetables, a herd of dairy goats, several litters of heritage pigs, and a food truck and catering company. After building a cheesemaking facility at the top of a ridge overlooking their farmstead’s pond in 2014, the family began crafting cheeses from cow’s and goat’s milk in 2015. They have since won awards from the N.C. State Fair, the American Cheese Society and Good Food Awards. Boxcarr’s top-selling varieties include Rocket’s Robiola, a silky cheese with almond and mushroom notes that is named after one of their goats; Cottonseed, a full- bodied cheese with a creamy, gooey center; and Lissome, a rich, melt-in-your-mouth cheese with a buttery exterior resembling a clean river stone. Boxcarr sells its cheese at the Durham Farmers Market and to the Durham Co-op, Weaver Street Markets and select Whole Foods locations. Several local chefs and restaurants feature Boxcarr cheeses on their menus as well. In Wadesboro, Brown Creek Creamery began producing cheese in 2014 on a small family farm with 16 registered Jersey cows and 14 heifers on about 8 acres. Husband- and-wife team Robert and Jennifer Stovall, along with Jennifer’s parents, Jeff and Sherry Poplin, make farmstead cheese with the milk they collect every day. Their cheeses include mild and sharp cheddar, a Colby cheese called Creekside, and a soft cheese they use as a base for their pimento cheese and many other varieties. Learn more about North Carolina cheeses and explore a map of cheesemakers at nccheesetrail.com.